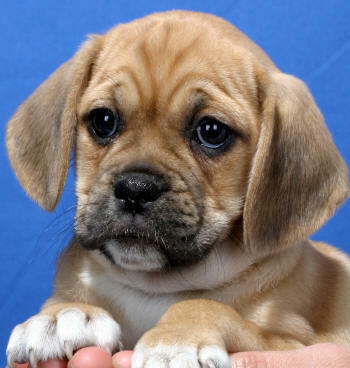 The Puggle is a small mixed breed created by mating a Pug and a Beagle. Pugs grow to be 15-30 pounds and 13-15 inches tall at the shoulder.These dogs are very energetic and have a thickset body. 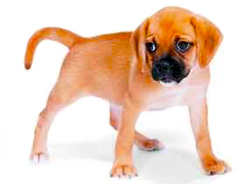 Puggles do not have uniform litters because it's not a purebred and as like any other hybrid or mixed breed they don't have standard litters, having some puppies looking more like a Pug and other pups looking more like a Beagle. Make sure you will be happy with both breeds, as they will have a tendency to behave more alike one parent than the other. This dog breed is traditionally very cute and sweet obviously playful very energetic and smart. They make good companion dogs.They usually get along well with others in a household, includingchildren and other pets. But you should remember that some Puggles will be more like Beagles and some will be more like Pugs. It's quite possible they may pick up a scent when you're out walking him and decide he'd like to run after a rabbit – quite un-Pug behavior, but very normal for a Beagle.Since these dogs have a short coat they are usually easy to groom. Both Pugs and Beagles are shedding dogs and this is not improved by crossing them.Like their Beagle parents, they are active dogs and need a fair amount of exercise. They may also howl on occasion. (Beagles are famous for baying at game. )Unfortunately, they may suffer from the health problems found in their parent breeds. Puggles may have the following health problems: cherry eye, epilepsy, skin infections, luxating patellas, back ailments and hip dysplasia. They can also suffer from some of the same respiratory problems that plague Pugs.If you are interested in this breed you should make sure that you discuss health issues with your breeder. Ask the breeder if they have screened the parent dogs for the health problems mentioned above.Try to visit the breeder so you can meet adult dogs. Ask if the breeder has had the patellas of the parents checked by a qualified vet and if the hips of the parents have been x-rayedEven though hybrid dogs are often claimed to be healthier than the purebred dogs from which they come,dogs are only as healthy as their parents and other ancestors. Genes do not go away. They are still passed down even when a hybrid breeding is done. If two dogs have the same problem, such as hip dysplasia, then the puppies will likely have the same problem, even if the parents are different breeds. That means that they are at risk of over breeding by people who want to breed them quickly and sell them fast without taking the time to do proper health screening. Take your time and ask questions about your puppy’s parents and health issues so you make a wise choice when you get a puppy. Don't let your companion become another Lost Dog statistic get a PawTrax GPS Tracker.click here for details. 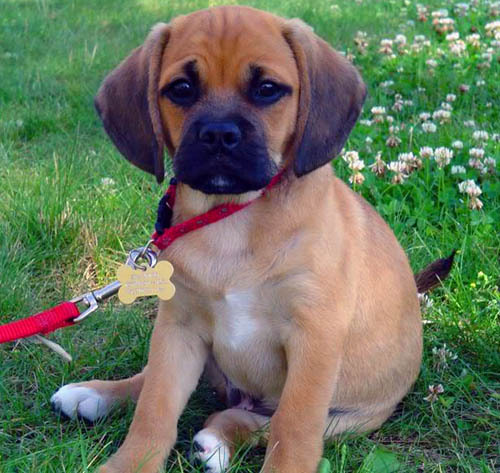 - Click here to know even more about the Puggle Dog Breed.